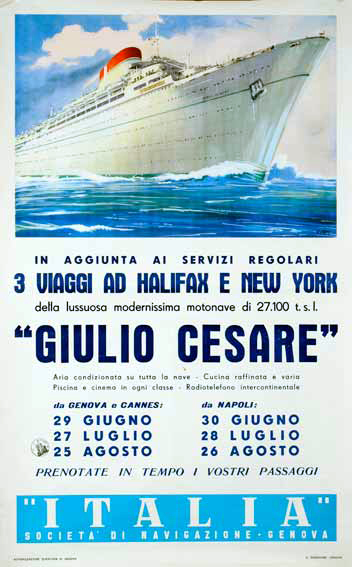 You are at:Home»Liner Stories»Ocean Liners»Hail Giulio Cesare! 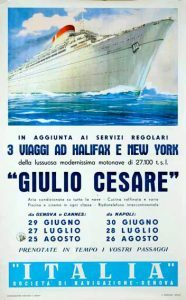 An Italian Line poster featuring a, uh… “fanciful” depiction of Giulio CesareGiulio Cesare. Giulio Cesare was designed for enjoyment as well as transport. The three-class liner was fully air conditioned and each class had its own outdoor swimming pool. A 1964 refit added a new cinema as well as bathrooms to staterooms that previously required passengers to use shared facilities. The refit also slashed the number of passengers classes from three to two.